Jute rugs have an inbuilt natural beauty and as and when it is used it gives a rich feel as the jute rugs are made of dried jute plants. It is mostly found in the original tan shade. This is the primary reason why jute bags manufacturers find it a profitable product to make. A Jute rug has a very high durability features. Unlike hemp and flax, it is useful throughout our lives. It is perfect for few locations, hangouts and partying. So it needs some maintenance and then it is perfect for an ideal location but not others. Jute Rugs are a completely natural and biodegradable resource. It is one of the main reasons for its sustainability is that it grows very quickly. Also, it is biodegradable which dedicatedly contributes towards eco-friendliness. Cleaning your jute rugs are also not a very difficult work. Only a small vacuum brush can remove all its dust, and make sure that it should not come in contact with the stitched area to prolong its life. Jute carpets also provide a good sound and heat insulation. Jute is very less expensive due to its abundance and it can be affordable than any other natural fibers like seagrass or sisal. Apart from Jute rugs, Jute Bags are also very famous amongst Jute bags manufacturers. We have many other things like gift bags, environmental shopping bags, promotional jute bags etc. 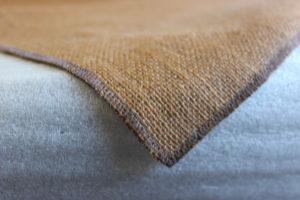 A jute Rug is a natural material and unlike other rug types, it cannot be steam cleaned nor can it be contacted with moisture because it can develop mold and mildew. So, we should avoid using it in bathrooms or overly humid climates. Sunlight exposure can also ruin and fade its natural color. It is not suitable for pet owners because jute has an absorbent factor and it hangs on to odors, unlike other natural fibers.